We were taken off the bus in Desaguadero and asked to walk across the frontier into Bolivia from Peru, clearing customs and immigration on the way through a set of iron gates. It was another half-an-hour before the bus was allowed to proceed over the border. We decided to go and sit with the locals from the bus while we waited. 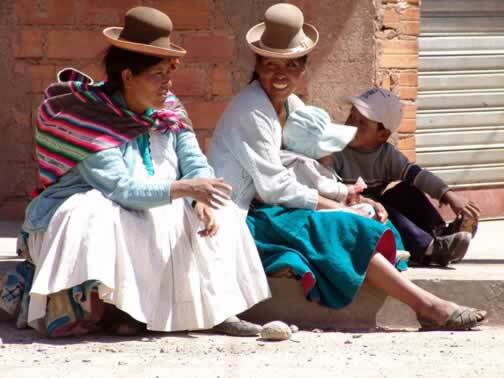 The conversation between these two Quechua women was lively and the only game in town. It was a fine place for a snack bar serving cold drinks, had there been one.